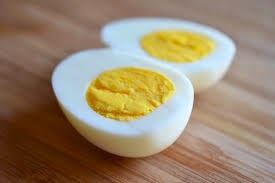 Fit Fluential Mom: Cooking the Perfect Hard Boiled Egg! Cooking the Perfect Hard Boiled Egg! This is something I think we have ALL struggled with at one point or another....... The PERFECT hard boiled egg. Not too soft, not too hard, no graish green yolk, and not looking like they've been attacked by baby teeth after you peel them. Eggs are HEALTHY when eaten in moderation so perfecting the way you cook them so you enjoy them is important! The whites have a TON of protein and the yolks are packed with omega-3s, essential aminos and B vitamins. Not to mention one egg has just over 70 calories and the whites are only about 17! Definitely something we should all include in our daily diets! So, here's MY way of making them after trying just about every method out there! Place eggs in saucepan & fill pan with cold water until eggs are covered by 1″. Heat water over high heat until it is at a full rolling boil. Remove pan immediately from heat, cover with lid, and leave for 10-15 minutes. Do all of this as quickly as you can safely as the idea is to “shock” the eggs. Let the eggs sit in the ice water for at least 15 minutes before peeling. Results: This was easy, practically foolproof, and produced delicious eggs. The eggs cooked for 10 minutes had soft, flavorful yolks. If you let them go beyond 12 minutes, the yolks may be bit chalky, but still edible. If you let them go to 15, they will probably be way too chalky-tasting but still not have that unappealing grey-green color or yucky sulfur taste. So,follow the steps above and try to stay within the 10-12 minute range. If they go a little beyond, you'll still have pretty looking eggs that taste much better than other methods I've tried! Clean, Guilt Free Salad Dressing! 25 Ways to Increase Your Water Intake!